Imagine renewing your cell phone contract and receiving a brand new iPhone 4S (or iPhone 5 if we wait a few weeks) or Droid Razr Maxx for next to nothing. You whip your phone out to tweet about your day, and someone abruptly bumps into you on the subway, knocking your brand new iPhone or Droid to the floor and shattering the shiny smudge-free screen. This scenario must occur thousands of times each day. For those of us who opted not to buy phone insurance, we are left to either buy a brand new phone at full price or an older phone off Craigslist or Amazon. If you had a FLYGRIP, the chances of dropping your phone and shattering the screen would pretty slim. The FLYGRIP is a clip-like handle that attaches to any smart phone. Simply slide two fingers into the ergonomically designed grip and your phone is now securely fixed to your hand. 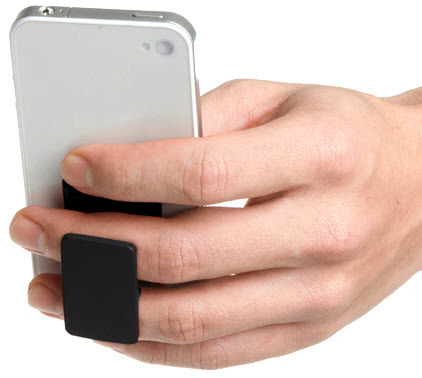 FLYGRIP allows you to free up a hand for secure phone use while multi-tasking. It also doubles as a kickstand so you can watch movies in style at work home. Have you dropped and broken your cell phone? Please share your stories in the comments below.